The Tigerpaw Community Coffee House is a place to share thoughts, ideas and trends in technology with your fellow Tigerpaw users. Find out the latest features and enhancements to Tigerpaw. Let us know what you think. A place to share your questions, ideas and best practices for utilizing Tigerpaw in these core functional areas. Select the sub-forum that best represents your topic to get started. Get quick news and updates on features, enhancements, and new functionality in Tigerpaw. Tell us what you think about them! The Feature Requests forum allows you to share your ideas for product updates as well as vote on your favorite Community suggestions. Each member has 10 votes. Ideas with more votes, posts, likes and discussion will be reviewed by the development team for future releases. Share files with other Tigerpaw users. 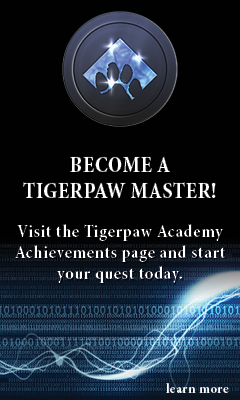 Be sure to mark your version of Tigerpaw when you upload your latest Matrix, reports and more! Posts from the former Tigerpaw Community site.